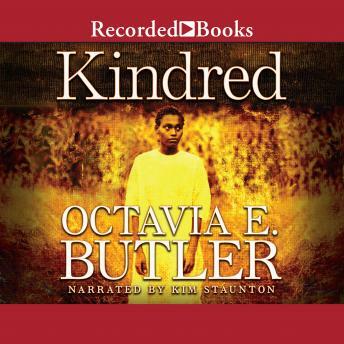 The first science fiction written by a Black woman, Kindred has become a cornerstone of Black American literature. This combination of slave memoir, fantasy, and historical fiction is a novel of rich literary complexity. Having just celebrated her 26th birthday in 1976 California, Dana, an African-American woman, is suddenly and inexplicably wrenched through time into antebellum Maryland. After saving a drowning white boy there, she finds herself staring into the barrel of a shotgun and is transported back to the present just in time to save her life. During numerous such time-defying episodes with the same young man, she realizes the challenge she's been given: to protect this young slaveholder until he can father her own great-grandmother. Author Octavia E. Butler skillfully juxtaposes the serious issues of slavery, human rights, and racial prejudice with an exciting science fiction, romance, and historical adventure. Kim Staunton's narrative talent magically transforms the listener's earphones into an audio time machine. I found this book very emotional for me and so we'll written I could experience the story as if I were traveling with Dana. I loved the book! After having read from the corner of the oval, I did find the author less descriptive. I thought the writing was great and it was an easy read! The author did a suburb job of weaving the beginning, middle and end into an excellent story! The time travel into the slavery days was a bit hard to read, but, very understandable. I would recommend the book.